Create a beautiful card & post-it note combination project. *Score and fold the 8-1/2” long Blackberry Bliss Cardstock piece and apply adhesive to the smaller scored end of the cardstock piece. 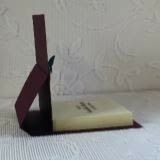 *Press the 2nd Blackberry Bliss (smaller) cardstock piece in place over the glue, making sure the ends are even. Fold on all score lines to resemble Photo 1. Add glue to the underside of the Post It Note and glue in place so that the front and sides are equally spaced. If you want to stamp a sentiment on the first page of the Post It note, do so now. 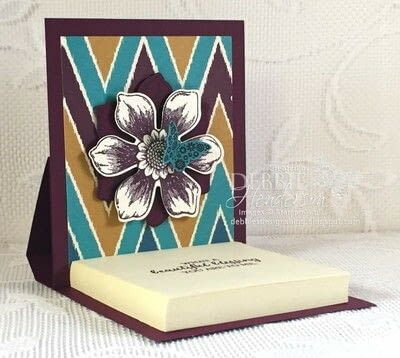 *Stamp the flower image using Blackberry Bliss Ink on Very Vanilla Cardstock and cut out with the punch. 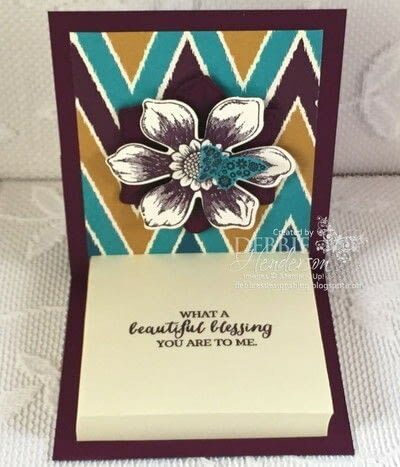 *Stamp an additional flower using Blackberry Bliss Ink on Blackberry Bliss Cardstock. *Layer the flowers with a Stampin’ Dimensional and glue to the Designer Paper. *Stamp one butterfly using Blackberry Bliss Ink on Tempting Turquoise Cardstock. 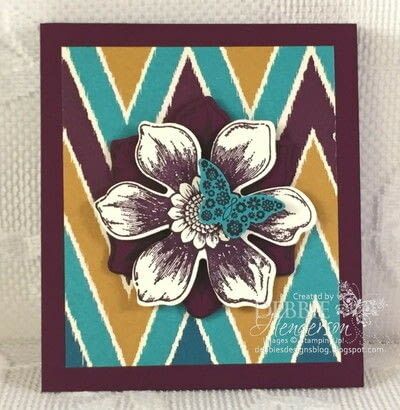 Cut out with the punch and glue to the flower with s small piece of a Stampin’ Dimensional.